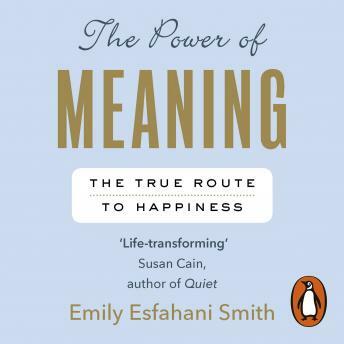 Random House presents the unabridged, downloadable audiobook edition of The Power of Meaning by Emily Esfahani Smith, read by Mozhan Marno. There is a myth in our culture that to find meaning you have to travel to a distant monastery or wade through dusty volumes to figure out life's great secret. The truth is, there are untapped sources of meaning all around us: right here, right now. Drawing on the latest research in positive psychology; on insights from George Eliot, Viktor Frankl, Aristotle, the Buddha and other great minds, Emily Esfahani Smith identifies four pillars upon which meaning rests: Belonging, Purpose, Storytelling and Transcendence. She also explores how we can begin to build a culture of meaning into our families, our workplaces and our communities. Inspiring and full of contemporary examples, The Power of Meaning will strike a profound chord in anyone seeking a richer, more satisfying life.